Item 1: Why was a maximum speed of 200 kph selected for trains operating between Toronto and Kitchener but a speed of 250 kph was selected between Kitchener and London? Item 1: Please provide minutes of meetings, emails, and documents that pertain to selecting a 200 kph speed between Toronto and Kitchener but selecting a 250 kph speed between Kitchener and London. Trains capable of 250 kph are significantly more expensive than those capable of only 200 kph (about $50 million each versus $35 million each – see Item 6). They are heavier, require more precise track geometry, require longer curve radius, and must be electrified. Electrification does not allow the use of existing track and the trains will not be able to operate until the whole system has been completed. Diesel, or hybrid power locomotives are unsuited for 250 kph operation. The distance between Toronto and London is 183.5 km. Of this, 66.2 km will be dedicated to 250 kph trains. Why use 250 kph trains on only 35% of the total distance when the whole system must be configured for 250 kph trains? Our calculation show that using 200 kph trains throughout the system will add less than 4 minutes to the total time between Toronto and Kitchener. (76.3 minutes instead of 73 minutes). From the outset there was a concern that the 73 minute estimate was not fact-based and indeed was physically impossible. (See item 5). 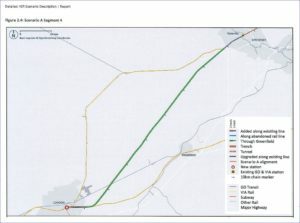 R1_Redacted – This report is about selecting 200 kph trains verses 300 kph trains. It also looks at using 240 kph trains but it has nothing to do with the question we asked. It is interesting to note that the report recommends direct access to Pearson Airport to generate ridership (the current HSR does not call for a stop at Pearson) and that HSR will be able to cover its operating cost if fares are 20% more than VIA Rail. (The Union Pearson Express was also supposed to cover its operating costs but has required a subsidy of $53 per ride since it started operation.) The report predicts a travel time of 78 minutes between Union Station and London if 240 kph trains are used. Why the government thinks slowing the trains down to 200 kph over 65% of the distance can reduce the travel time to 73 minutes has not been explained. R2_Redacted – This report is about the track alignment and stations. It has nothing to do with our request but it does confirm the route from Kitchener to London as being along the Hydro Line. The route in the document (on the left) is very similar to the map we generated from the RFQ for the Study of the EA. R3 March-22-2018 11.30am – This is a series of emails that does pertain to the question of 200 kph versus 250 kph trains. The emails were written in March of 2018, after the start of the Environmental Assessment. The emails show a series of graphs and tables but there is no data and/or methodologies. Furthermore, the track curvatures and maximum speeds obtained are unknown. There are no graphs or tables for the mix of 200 kph between Toronto and Kitchener and 250 kph between Kitchener and London. However, the emails are about an average speed of 200 kph. 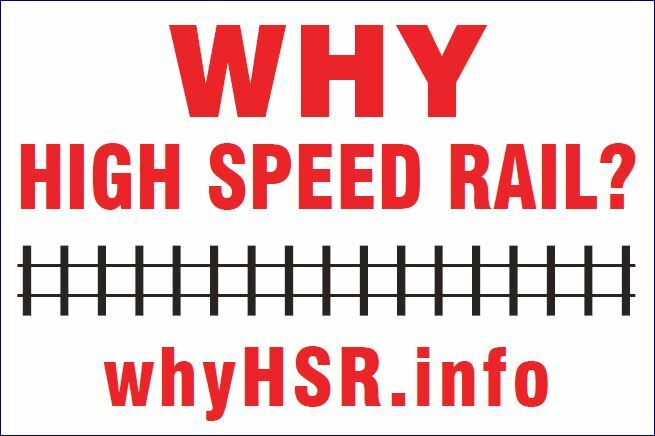 The average speed for the proposed HSR is 150 kph so the document is irrelevant. Note that MTO is concerned about “minimizing impacts of existing infrastructure (hydro corridor)”. There are no concerns about impacting rural communities and farmland. This report has nothing to do with the question we asked. Also note the table on page 4. This was used for the projection of 73 minutes between Toronto and London, however, the table on page 5 does not support the 73 minutes. The closest that table gets is 74 minutes but that requires running at a top speed of 250 kph throughout the complete system. However, all the discussions and calculations assume the dedicated HSR corridor is 88 km long (i.e. Kitchener VIA station to London VIA station). 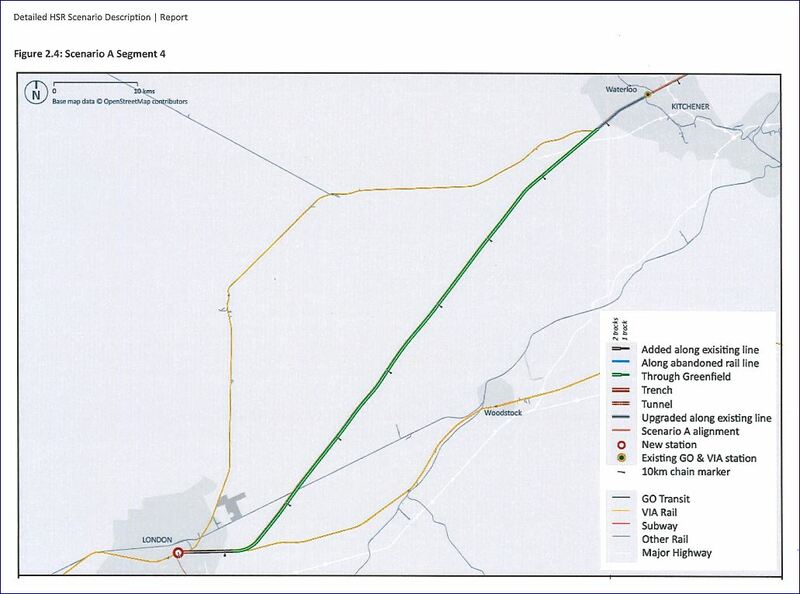 In fact, the proposed HSR corridor is 66.72 km long. The remaining track is either in the station buffer zones, city centres or residential areas, and uses existing shared track with restricted speed limits. R4 March-28-2018 4.28pm_Redacted – This email corrects an error in a draft document (not included) and trains will now run at 200 kph west of Brampton instead of 250 kph. This email does pertain to the question we asked but there is no reason, discussion or supporting document provided for the change in speed. Why was the draft document not included in the FIR? R5 April-02-2018 6.00pm – This series of emails is about the average speed between Kitchener and London. These emails suggest that in March 2018, MTO had still not done any studies on the configuration of 200 kph and 250 kph speeds. We do not know how it is possible to calculate a travel time of 73 minutes without studying the speeds of each segment. It has nothing to do with the question we asked. R6 August-23-2016 1.00pm_Redacted – This email is regarding a meeting on August 23, 2016 to brief the Special Advisor on the Business Case. It is assumed that VIA Rail will continue on the corridor at current frequency and speed. See Item 10 for a discussion on the viability of VIA Rail. This email also notes that the cost for rail rationalization is not included in the capital cost estimate. Rail rationalization refers to separating freight from passenger service and this will be a major cost. The report uses 88.3 km for the distance of the Hydro corridor. It is incorrect, the distance is 66.72 km. Furthermore, the report says travel times between Toronto and London will be 83 minutes at 200 kph. Interestingly, the Toronto – Kitchener demand forecast is 73% of the total ridership. This leaves 27% for the Kitchener to London segment. The report also says that business travel will be 12% of ridership, commuters 36% and leisure travel 51%. No data is provided to support these numbers. This report has nothing to do with the question we asked. R7 September-29-2016 4.09pm – This series of emails is about edits to the Steer Davis and Gleave Preliminary Business case. The report was edited to replace references to 240 kph trains with 250 kph trains for the Toronto to Kitchener segment. This response has nothing to do with the question we asked. R8 October-20-2016 3.44pm – This report refers to 250 kph trains between Toronto and London. This report has nothing to do with the question we asked. R9 October-21-2016 9.54am – This report also refers to 250 kph trains between Toronto and London. This report has nothing to do with the question we asked. R10 October-28-2016 4.26pm – This email is about 200 kph trains between Toronto and Kitchener and 250 kph between Kitchener and London but there is no data, no attachment, nothing other than some vague reference to tunnels through Brampton and access to Pearson. This response has nothing to do with the question we asked. R11 November-01-2016 3.50pm – This email is about 200 kph trains between Toronto and Kitchener and 250 kph between Kitchener and London but there is no data, no attachment, nothing other than a statement that there is no cost savings by using 200 kph trains instead of 250 kph trains between Toronto and Kitchener. This response has nothing to do with the question we asked. R12 November-01-2016 8.30pm – This email is also about 200 kph trains between Toronto and Kitchener but there is no data, no attachment, nothing other than a statement that there is no cost savings by using 200 kph trains instead of 250 kph trains between Toronto and Kitchener. This response has nothing to do with the question we asked. R13 November-03-2016 3.29pm_Redacted – This email is also about 200 kph trains between Toronto and Kitchener but there is no data and no attachment. This response has nothing to do with the question we asked. R14 November-03-2016 9.21pm – This email is also about 200 kph trains between Toronto and Kitchener but there is no data and no attachment. It has nothing to do with the question we asked. R15 November-04-2016 12.08pm – This email is also about 200 kph trains between Toronto and Kitchener but there is no data, no attachment. This response has nothing to do with the question we asked. R16 November-08-2016 7.58am – This email is a request to Hitachi to upgrade the speed specification for the AT300 from 160 kph to 200 kph to be consistent with the London to Windsor specified speed. This response has nothing to do with the question we asked. Of the 16 items provided by the government, only one pertains to the question of why 200 kph was selected between Toronto and Kitchener and why 250 kph was selected between Kitchener and London, but no data was provided and the draft report is missing. No justification was provided for selecting 250 kph trains between Kitchener and London. ← Niagara Falls is getting all-day, two way GO train service in 2023. Why not London?